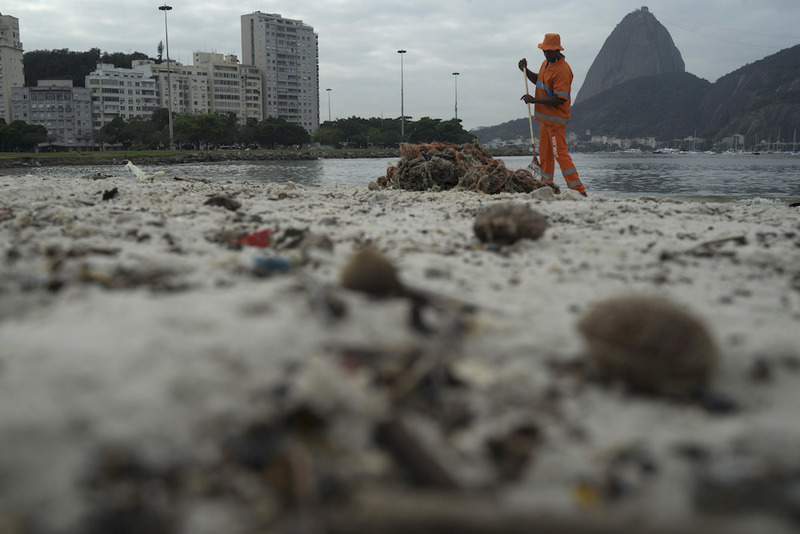 In Brazil, Olympic rowers and sailors will chase gold through dying rivers and poisoned lagoons. Even amid all the crises piling up on this year’s games—unfinished infrastructure, political drama, financial turmoil, the Zika epidemic that had prominent experts calling for the games to be moved—the water stands out. Reports say athletes may have to compete in oil-slick water stinking of raw human sewage and contaminated with antibiotic-resistant bacteria. Their boats are already turning brown. Marquee sporting events are often billed as a great boon for cities and the environment. Chapter 1 of the Olympic Charter tasks the International Olympic Committee with encouraging “a responsible concern for environmental issues.” Cleaning up Rio de Janeiro’s water was a centerpiece of Brazil’s 2009 proposal to host the games, but efforts fell behind or failed to materialize. And this won’t be the first Olympics to struggle to meet environmental promises. As ESPN pointed out, Sydney had its own water problems in 2000, and the smog in Beijing got 2008 dubbed the “most polluted Olympics ever.” We shouldn’t be surprised; environmental cleanup efforts in sprawling metropolises almost always take more time and money than expected, in part because they push against the steady current of environmental degradation that comes with life in the industrialized world. But Brazil’s rivers are just the tip of the melting iceberg. To paraphrase Naomi Klein, climate change changes everything—including sports. In the sinking island nation of the Maldives, kabaddi players have told my collaborator Adam Flynn that they are adapting their traditional tag game to be played in shallow water. In Alaska, snow was hauled in by train in March to make the Iditarod sled race possible, and even then parts ran over a bone-jarring mixture of ice and dirt. Climate change combines with countless instances of wrecked ecologies—poisoned waters, polluted skies, and dead landscapes—to form a larger environmental megacrisis that will profoundly shape how we spend time outdoors. Sports, like so many human activities, balance our competing impulses to adapt to and control our environment. We celebrate the endurance required to compete on the “frozen tundra” of Lambeau Field in Green Bay, Wisconsin, while underground electric wiring prevents Lambeau’s turf from actually becoming frozen. Golf began as a conversation with the landscape of Scotland; now it is played on designed-from-scratch courses in Arizona that consume more than 80 million gallons of water daily. In a way, these feats of engineering are impressive—just like the Hoover Dam or the Panama Canal. But now we are increasingly forced to adapt to the consequences of our own past attempts to control our environment. When you’re left gasping during an outdoor run, it’s pedantic to try to draw a crisp line between the harsh effects of a record-breaking heat wave and those of dangerous, choking smog. Both are equally oppressive. (In fact, they compound each other.) The same goes for Rio’s rivers, dying of contamination, and Aspen’s melting snows. Due to the same poor planning that gave us the climate crisis, we’re suffering from a loss of outdoor spaces suited for play. Winter sports have long supplemented the elements with artificial snow and ice, but soon fabricated winter may be the norm. Sochi, host of the 2014 Winter Games in Russia, was a subtropical beach town. Dubai and Qatar have built indoor ski slopes in scorching deserts that climate change is making increasingly inhospitable. Qatar also plans to use advanced new cooling technology to keep 2022 World Cup players from passing out from the heat in their open air stadiums. Engineered environments like these—and air-conditioned, covered football stadiums—are the beginning of a costly, high-tech effort required to preserve and adapt our great cultural rituals for a warmer planet. As adaptation to a harsher climate increasingly requires more sophisticated and costly technologies, the danger is that already-expensive sports like skiing or sailing will become even more rarefied drivers of inequality. The very affluent may be able to pay for the privilege of living like climate change isn’t happening, but many of us will be priced out of certain sports for good. Climate change combines with countless instances of wrecked ecologies—poisoned waters, polluted skies, and dead landscapes—to form a larger environmental megacrisis that will profoundly shape how we spend time outdoors. That’s a shame, because sports have long brought together people from all walks of life. Now, we may go beyond the divide between the cheap seats and the VIP box. We may be headed towards a world with two sets of games: those played in the manicured spaces inhabited by the very affluent and those played on the hot, troubled planet left to the rest of us. This spring I participated in Arizona State University’s “The Future of Sport 2040” Emerge Festival, along with my colleagues at the Applied History Institute. For our installation—“The Games That Got Us Through”—we imagined an American climate migration and the new sports of its refugee culture. The centerpiece was Cistern, a tag-like game of ritualized water raiding that seeks to minimize violence in the struggle over a scarce resource. It was a timely thought experiment. The Olympics in Rio will, for the first time, feature a team of refugee athletes. With millions fleeing violence, and millions more likely to flee rising seas and broken ecosystems, we need to start figuring out how displaced people can live lives of dignity in the 21st century. And that means figuring out where and how people can run, jump, and play in an increasingly volatile world. Games and sports can be a great boon for people in precarious situations. They can help settle conflicts peacefully. They can bring communities together, turn suspicions into friendships. They can give young people an outlet for energies that could otherwise turn disruptive or dangerous. Events like the World Cup and the Olympics can be sources of inspiration, excitement, and shared identity for people in difficult times. Thus it’s a productive exercise to think about the games we might play in the future. The good news is that we can change the games we play much easier than we can change our agricultural infrastructure, or evacuate the billions who live in the path of rising seawaters. We don’t know what new sports the Olympics might include a century from now. But we should adapt, and celebrate new games even as we memorialize the lost ones. Let’s not forget: Just like Venice was founded by refugees, basketball was invented during a storm. Andrew Dana Hudson writes about climate change from Oakland, California, and collaborates with the Applied History Institute on prefigurative games and fiction. Primary Editor: Andrés Martinez. Secondary Editor: Torie Bosch. *Photo by Leo Correa/Associated Press.